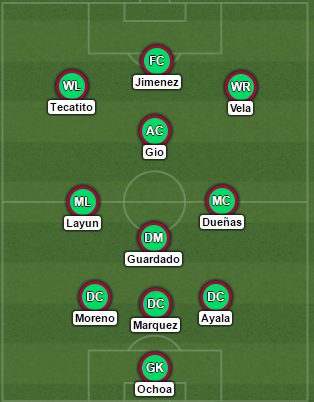 Osorio will look to counter USA’s size and speed. The threat of Vela, Jimenez and Tecatito is likely to limit the forward runs by Fabian Johnson. Johnson will remain a threat, however. Andres Guardado, Jesus Dueñas and Miguel Layun are charged with isolating and disrupting Michael Bradley and Jermaine Jones. This midfield trio will look to repeat the work done on Bradley by Guardado and Hector Herrera during the CONCACAF Cup victory in 2015. While not being a fan favorite in some circles, Jesus Dueñas has been an Osorio mainstay. Dueñas has been one of Osorio’s main utility players. Using him as both a rightback and a defensive midfielder when needed. His qualities are very similar to Mexico favorite Efrain Juarez. His presence as a midfielder will give the team balance and cover the backline needs. Jurgen Damm and Javier Hernandez roles as substitutes are keys to closing out the game (Or opening it up). Damm alternate to the injured Aquino much to the chagrin of Chivas fans around the globe who preferred Isaac Brizuela. While Brizuela is having the season of his career, Damm is faster and less of a defensive liability. If the game is close expect Hernandez and Damm to join the fray in the second half looking to break the game open with direct play.